In this tutorial we are going to discuss the serial communication using UART. For more info on UART/RS232 check 8051 tutorial. LPC1768 has four inbuilt USARTs. We are going to discuss only UART0. After this tutorial you should be able to extend it to remaining three UARTS. After understating the basics of LPC1768 UART module, We will discuss how to use the ExploreEmbedded libraries to communicate with any of the UART devices. UART module and registers. LPC1768 has 4-UARTs numbering 0-3, similarly the pins are also named as RXD0-RXD3 and TXD0-TXD3.As the LPC1768 pins are multiplexed for multiple functionalities, first they have to be configured as UART pins. Below table shows the multiplexed UARTs pins. The below table shows the registers associated with LPC1768 UART. DLL Least Significant Byte of the UART baud rate generator value. DLM Most Significant Byte of the UART baud rate generator value. Now lets see how to configure the individual registers for UART communication. LPC1768 has inbuilt 16byte FIFO for Receiver/Transmitter. Thus it can store 16-bytes of data received on UART without overwriting. If the data is not read before the Queue(FIFO) is filled then the new data will be lost and the OVERRUN error bit will be set. This bit is used to enable/disable the FIFO for the data received/transmitted. 1--FIFO is Enabled for both Rx and Tx. This is used to clear the 16-byte Rx FIFO. 1--CLears the 16-byte Rx FIFO and the resets the FIFO pointer. This is used to clear the 16-byte Tx FIFO. 1--Clears the 16-byte Tx FIFO and the resets the FIFO pointer. This is used for Enabling/Disabling DMA mode. 1--Enables DMA only when the FIFO(bit-0) bit is SET. This bit is used to select the number of bytes of the receiver data to be written so as to enable the interrupt/DMA. This register is used for defining the UART frame format ie. Number of Data bits, STOP bits etc. This bit is used to Enable or Disable the Parity generation and checking. 0-- Disable parity generation and checking. 1-- Enable parity generation and checking. These two bits will be used to select the type of parity. 00-- Odd parity. Number of 1s in the transmitted character and the attached parity bit will be odd. 01-- Even Parity. Number of 1s in the transmitted character and the attached parity bit will be even. 10-- Forced "1" stick parity. This bit is used to enable the access to divisor latch. The is a read-only register that provides status information of the UART TX and RX blocks. This bit will be set when there is a received data in RBR register. This bit will be automatically cleared when RBR is empty. 0-- The UARTn receiver FIFO is empty. 1-- The UARTn receiver FIFO is not empty. The overrun error condition is set when the UART Rx FIFO is full and a new character is received. In this case, the UARTn RBR FIFO will not be overwritten and the character in the UARTn RSR will be lost. This bit is set when the receiver detects a error in the Parity. THRE is set immediately upon detection of an empty THR. It is automatically cleared when the THR is written. TEMT is set when both UnTHR and UnTSR are empty; TEMT is cleared when any of them contain valid data. 0-- THR and/or the TSR contains valid data. 1-- THR and the TSR are empty. This bit is set when the received data is affected by Framing Error/Parity Error/Break Error. 0-- RBR contains no UARTn RX errors. 1-- RBR contains at least one RX error. When this bit is 1, the data written to the THR is output on the TXD pin. If this bit is cleared to 0 while a character is being sent, the transmission of that character is completed, but no further characters are sent until this bit is set again. In other words, a 0 in this bit blocks the transfer of characters. Note: By default this bit will be set after Reset. LPC1768 generates the baud rate depending on the values of DLM,DLL. PCLKSELx registers contains the PCLK info for all the clock dependent peripherals in which Bit6,Bit7 contains the Uart Clock(ie.UART_PCLK) information. The UART_PCLK and the actual Peripheral Clock(PCLK) is calculated as below. Using the above parameters , DLL/DLM is calculated as below. (256 * DLL + DLM) = PCLK / (16* Baudrate). 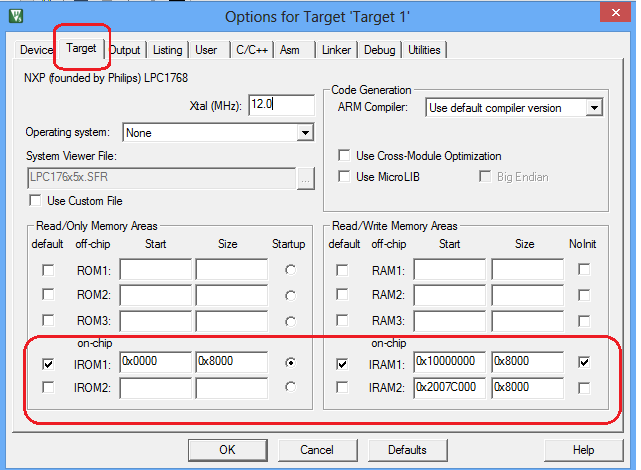 Below are the steps for configuring the UART0. 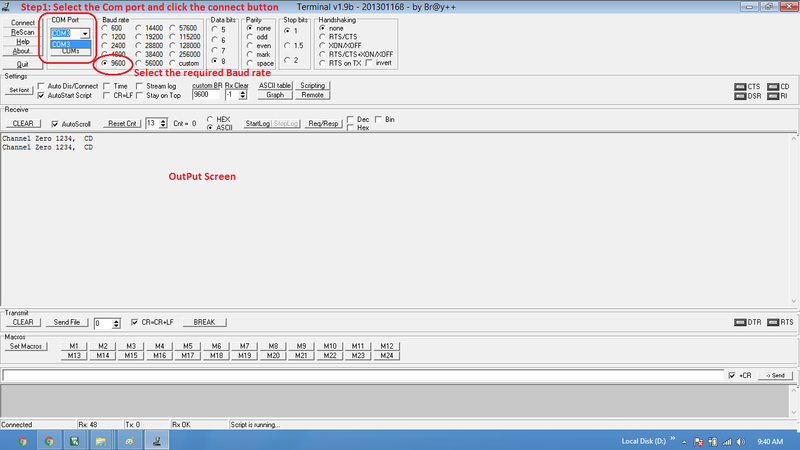 Step1: Configure the GPIO pin for UART0 function using PINSEL register. Step2: Configure the FCR for enabling the FIXO and Reste both the Rx/Tx FIFO. Step3: Configure LCR for 8-data bits, 1 Stop bit, Disable Parity and Enable DLAB. Step4: Get the PCLK from PCLKSELx register 7-6 bits. Step5: Calculate the DLM,DLL vaues for required baudrate from PCLK. Step6: Updtae the DLM,DLL with the calculated values. Step6: Finally clear DLAB to disable the access to DLM,DLL. After this the UART will be ready to Transmit/Receive Data at the specified baudrate. Step1: Wait till the previous char is transmitted ie. till THRE becomes high. Step2: Load the new char to be transmitted into THR. Step1: Wait till the a char is received ie. till RDR becomes high. Step2: Copy the received data from receive buffer(RBR). In the above tutorial we discussed how to configure and use the inbuilt LPC1768 UART. Now we will see how to use the ExploreEmbededd UART libraries to communicate on all the four UART channels. For this you have to include the uart.c/uart.h files and associated gpio/stdutils files. 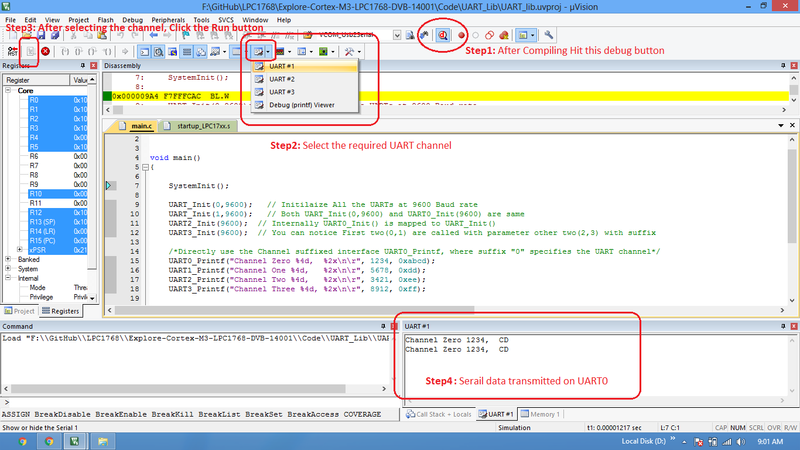 As LPC1768 has four inbuilt UART channels, the interfaces are suffixed with channel number as shown below. Note:Refer the uart.h file for more info. After generating the hex/bin file, flash it to the controller. Now connect the LPC1768 to your system using a Usb to Serial converter. Open the terminal software , select the COM port, set baud rate and hit the connect button. Code can be tested on the Keil simulator as well. For this the target memory options needs to be set to default as shown below. Now Rebuild the project and Run the code using the Keil simulator as shown below. Have a opinion, suggestion , question or feedback about the article let it out here!